The UK’s best health and wellbeing show is coming to the East Midlands! Enter the world of Unlimited Wellbeing to find 3 great shows in one, featuring Health & Fitness, Holistic and Body Beautiful with over 200 leading health and wellbeing professionals exhibiting. Enjoy free workshops and classes, browse amazing products from all over the world and get free advice from some of the most respected practitioners in the UK before indulging yourself with a luxurious massage or spa treatment in our pamper zone. Find a better you at #UWELL2019 ? Ticket price includes entry to the exhibition and market along with all classes and workshops taking place across 3 event stages and on the ice rink. 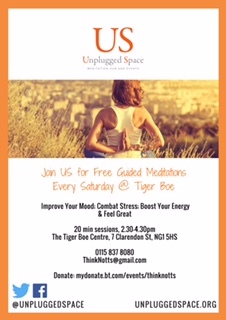 To find out more information visit the Unlimited Wellbeing website. Under 5’s are free of charge but must have a ticket. These tickets are not available to purchase online, please contact the box office on 0115 853 3101 to add an under 5’s ticket to your order. Ruth Chambers (our ‘Country Member’ in North Devon!) will be in the Derby area for a few days at the end of January so do let her know if you’d like to meet up for coffee or if you’d like a Reiki or Life Coaching session. For anyone who has trained In Reiki to enjoy relaxing with like-minded companions, give and receive a full treatment, enjoy group healing, share your stories of how you use Reiki and receive some extra teaching. Plus some peaceful meditation and thoughts on making the best of 2019. The fee for the day is £37.50 on the day or by bank transfer in advance. Bring food to share for lunch. Contact Ruth as soon as possible if you are interested in joining, have already taken this course and want to do a refresher or would like to chat about the course. This 4 day course with practical work is spread over 6 months so there will be one more day in Spring and another in summer which will be arranged on the first weekend. This course is open to all Reiki 2 Practitioners who wish to continue their Reiki development. to fully open up your energy system to Reiki, causing a significant increase in the flow of healing energy increasing the effectiveness of your treatments and your self healing. about Psychic Surgery using visualisation to clear out blockages in the energy system. how to do the Violet breath and Microcosmic Orbit – a breathing and visualisation technique for self development and to use when passing Attunements. 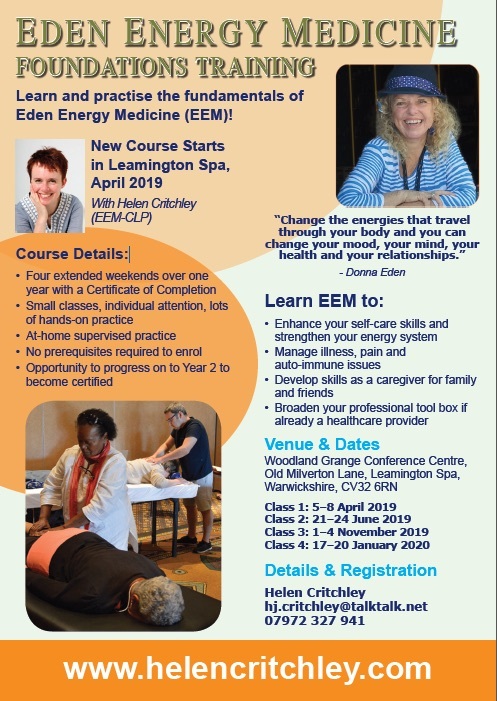 I am delighted to be offering the Eden Energy Medicine (EEM) Foundations Training Program again this year, from April 2019 – January 2020. This time we will be in Leamington Spa, Warwickshire, in the Midlands, UK. There are no prerequisites to enrol in the Foundations Program; the course is suitable for anyone who is interested in and wants to learn more about the fascinating field of energy medicine. The Foundations Program consists of four x 4-day classes, with each class taking place over a long weekend: Friday to Monday. The classes are intensive, packed with information, energy balancing techniques and hands-on practice. The classes will be both informative and fun, offering the chance to learn together and to develop skills within a supportive environment. The launch of ThinKNotts, is on Saturday 13th May – a holistic event inspired by the 1993 Washington DC experiment that saw thousands of participants use meditation to bring about a more peaceful and connected community. If you have friends, family or wider networks that you think would be interested, please do share this with them. The invitation is below – also see ThinKnotts Press Release – all the details and booking information are in this link if you’d prefer to share that. Get your tickets early. Tickets £5 with under 18’s free. Ruth Chambers is running another restful Meditation Retreat Day at Champneys Springs Health Spa, Ashby de la Zouch on Sunday 18th June 2017. Champneys is a​ wonderful venue designed entirely for relaxation and pampering! C​ome and enjoy a totally relaxed day to discover your own inner stillness and happiness. Enjoy a variety of meditations and breathing techniques in the company of like-minded people. There’s plenty of time to share your experience of the meditations and to get all your questions answered. ​For only £10 extra you can enjoy a swim, sauna and steam in the luxurious spa after the meditations. If you want to stay over on the Saturday or Sunday nights I can arrange accommodation at the Spa for you. ​S​o often the challenges and relentless pace of life make it too difficult to connect with our inner​ peace and stillness. ​We all need to give some space to slow down, de-stress, breathe and let go. Meditation is easy to learn but challenging to do ​on your own sometimes – it’s much easier in a group with someone leading. So enjoy this uplifting day to take it easy and let go of your worries and concerns. Take this opportunity to relax completely whilst Ruth’s calming voice soothes and inspires you. You’ll have ​plenty of time to discuss your experiences, inspirations and insights in a small group. ​Until the end of this month you can get it at the bargain price of £85! as well as a fabulous, healthy, eat-all-you-want buffet lunch. ​​Get the Early Bird Discount – only £85 when you pay by April 1st. To reserve your place download the Summer Meditation Day booking form complete and send with your cheque, or to find out more please call Ruth on 01805 038132 or 07789 020 668. This conference comprises a very wide-ranging, informative and useful talks and workshops. It’s very good value and there’s some world-renown speakers involved. Sandy and Jacky went last year and, as sports/remedial massage therapists, we found it tremendously useful. There are up to 4 talks happening at any one time, so you have to make hard choices. However all the talks are videoed, so afterwards, the organisers send you the full programme of talks, for you to listen to any talks you missed and were interested in. It’s now advertised on the front page of the FHT website and you can book your tickets via the Therapy Expo website. They have organised reduced rates for local hotels. Harley and Louise, Co-ordinators of FHT Alfreton LSG have arranged this ticket-only event with limited places available. Book your place now and don’t miss out! Pete Cohen is a life coach, public speaker, TV presenter and bestselling author of eleven books about making positive life changes and weight loss. He works as a peak performance coach for world-class athletes, including Dame Ellen MacArthur, Ronnie O’Sullivan and Dame Sally Gunnell. Pete is well known for his regular morning TV appearances on GMTV and BBC2’s Confidence Lab. He was recognised internationally for defining the ‘Formula for Happiness’ in 2003. As a life coach, life strategist and human behaviourist he works with people to create positive change in their lives. Pete shares regular advice live on social media at 7am weekday mornings, covering all areas of life coaching and personal development. He does this completely FREE to help people create a better life for themselves. If you feel your best days are ahead of you and you want to achieve more, be happier and more successful then join the mi365 conversation and share your story as you start to grow. Some of you may recall Chris Newbold from Biocare came to talk at a group meeting in July 2014. Their seminar on ‘Nervous Breakdown’, presented by the very dynamic Alessandro Ferreti, was extremely interesting and useful on the interaction of environment, hormones and genes on the Nervous System. While it’s aimed at nutritionists, the information was very relevant, both personally and professionally. There are also webinars on a wide range of conditions and research about health and well-being.